Gill is currently producing figures for use in an information sheet that will be provided to participants in a clinical trial. 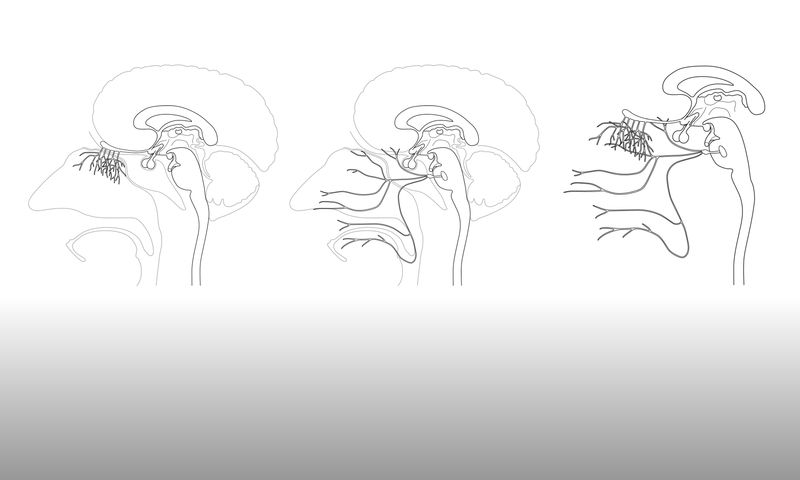 Part of the trial would involve the participant having an MRI scan of their brain and so Gill has been experimenting with producing illustrations of MRI brain scans, as shown in the header image and also below. Ordinarily, drawn images of scan results would not be acceptable for use in figures in journal articles, as a scientist is not permitted to manipulate a data image in any way that changes the data. Instead, screenshots of the results are taken directly from the scanning software. However, as these images are simply being used to show participants what a typical MRI scan looks like, and the exact results of the scan do not matter, a drawn illustration may be more appropriate than a screengrab image file. Aa a vector file, an illustration can be high resolution and so can be reproduced at any size without adversely affecting the image. By contrast, screengrab image files can often appear pixellated, even when reproduced at relatively small scale. Another advantage is that highlighted areas of the brain can be drawn in any location, which means that an image can be produced that exactly matches the requirements of the information sheet. Drawing a realistic illustration of an MRI scan is not a simple process and certainly the image of a sagittal section through a human head would take a lot more work to make it as detailed as the original scan. As shown below, with the drawing to the right of the original MRI scan, the drawing is not particularly convincing. However, the illustration of an MRI scan showing the 3D brain is easier to draw and the results are show below, to the right of the original image. More detail could of course be added, but the illustration is already reasonably convincing. Also, any highlighted areas can easily be added in separate layers in Adobe Illustrator, to allow them to be switched on and off, as required. Whether these kind of illustrations would be of use when visually communicating with clinical trial participants, or patients in general, remains to be seen.